Millwall beat Burton Albion by a single goal to nil to leave them just 6 points off the play off places after a hard fought victory against the strugglers. That is four wins away from home on the trot now thanks to a Ben Marshall’s second half winner that puts Millwall up to 12th in the Championship. 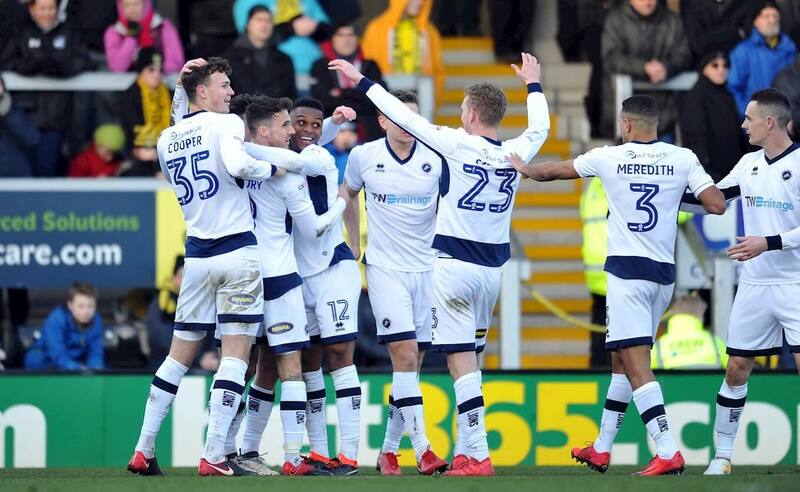 Getting into the play offs is unlikely but Millwall have looked dominant in defence so far in 2018 and once again set their stall by putting up road blocks in the defence, something they have done time and time again of late. It’s unlikely that they will make the play offs but on this fine run of form certainly not impossible. Despite having as much as 58% of the possession Burton failed to muster a single shot on the Millwall goal which tells you why the home team are stuck in the bottom three of the table. They dominated play at times but Millwall just let the home team attack and looked to catch Burton Albion out either on the counter attack or via a set piece. Once again Millwall were tough and resilient as they took all 3 points back down to South London for Neil Harris’s happy men. The away side were never going to take prisoners as they amassed a humungous 20 fouls in the game. Burton had a lot of the game in a scrappy affair however they couldn’t deliver a decent final ball and that is now 13 home games without a win of which they have lost 11 of those games. That’s relegation form in anyone’s books. They had a lot of chances but Millwall keeper Jordan Archer did not have to make a single save as Millwall defended well. 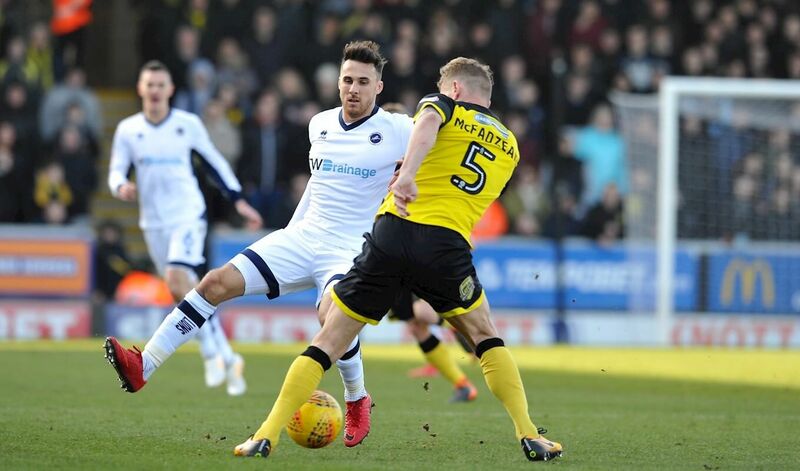 An attendance of 4.105 at the Pirelli Stadium saw the hosts look tired after Millwall’s fairly physical presence in the middle of the park as Nigel Clough’s men dropped a place to 23rd in the league. It was Ben Marshall the Wolves loanee who got on the end of deep cross at the back post and the ball seemed to take an agonising long time to cross the line and ultimately condemn Albion to another home defeat without a win on home soil in the league this season. The Lions bared their teeth first on eleven minutes. Steve Morison sent over a dipping cross that was heading for Lee Gregory at the back post until Lucas Akins got up first to head behind at the expense of a corner. After Martin Samuelson did some decent work on 20 minutes he found Akins who flicked the ball onto the roof of the net from twelve yards out. A loose touch by Akpan on half way gave Millwall the chance to counter and although Tom Naylor did superbly well to nullify the threat of Lee Gregory, Morison was still able to deliver in a cross that McFadzean had to head away awkwardly from inside his own six yard box at the expense of a corner. The danger was not over there and when Cooper got up well to attack the corner there was an almighty scramble near the post before Bywater eventually managed to get both hands on the ball as things got a little bit messy. Bent had a second chance to open his account on 39 minutes. A pinpoint ball from Davenport had the striker bearing down on goal but his shot sliced away off his shin failing to threaten Archer in the Millwall goal. So a goalless first half and the second half began in much the same way and Dyer sent in another dangerous low delivery it took a shanked clearance from Shaun Hutchinson to keep his goal in tact as the ball skewed over the bar from close range. When the Millwall goal came it was somewhat against the run of play. Jed Wallace managed to escape on the left and send over a searching cross that picked out Marshall at the back post and his looping header seemed to trickle over the line. Sub Onyedinma replaced Ben Marshall and he went close with a curling effort on 73 minutes but fortunately for Albion put his effort wide of the post as the visitors looked to wrap up the points. The Brewers spurned a glorious chanxce to equalise on 78 minutes. Davenport’s corner was flicked on at the near post by Akins and the goal appeared to open up for Naylor at the back post, the centre half stealing in but unable to keep his header under the bar. Naylor’s last ditch header in stoppage time was the last chance for Albion to drag themselves level but once again the game had got away from Albion who see their three game unbeaten run ended. Time for a bet on the Lions? Then follow this link.